What did George Bernard-Shaw mean by his statement, “All professions are conspiracies against the laity”: Professions acquire status, authority and wealth by taking unto themselves, (in Sri Lankan context thanks to free education), a body of knowledge and proficiency and only renounce it in small amounts in exchange for a fee. Named after Hulft, the Dutch General who was shot by a Portuguese soldier in 1656— the village where the gruesome murder took place happened to be known as Hulft’s Dorp, (dorp in Dutch means village) soon became Hulftsdorp, the hub of Sri Lanka’s legal fraternity. While the lawyers upheld the decorum and dignity of the profession, the medical profession in Government service seems to have deviated and lost track, and is busy with regular press briefings on ‘struggles’, mostly on issues that do not affect them or the society at large, apart from a small group of their membership’s political interests. Why do their counterparts, the lawyers, do not believe in such struggles? This writer’s speculation in this regard prompted him to dig into the archives related to Hulftsdorp and trace the historical records on lawyers’ collective agitations, attitudes and approaches on certain issues affecting their professional carriers in contemporary ‘politics’. 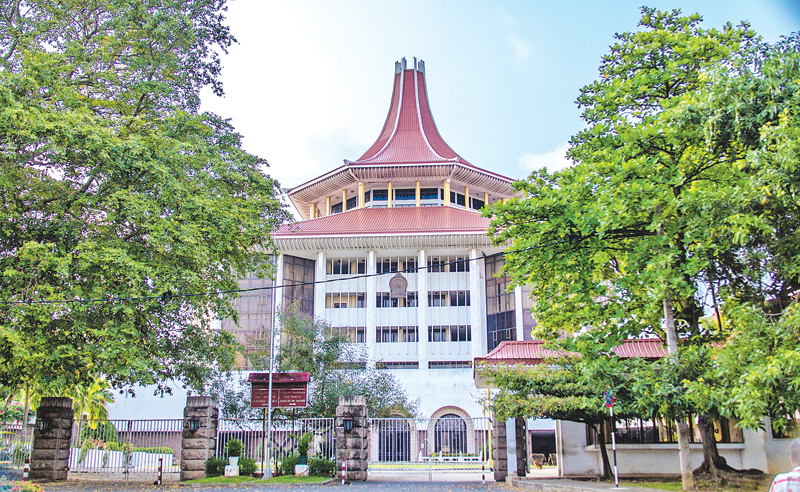 He came across an instance of lawyers threatening a ‘down-tools’ 60 years ago in 1958, opposing the Justice Minister in the SWRD Bandaranaike government, M W H de Silva (Lawyer/Senator and grand uncle of State Minister Dr. Harsha de Silva), against his proposal to introduce an enactment aimed at scuttling their freedom in levying fee from clients, which the Minister termed as irrational or arbitrary by lawyers. The Bar Council met and passed a resolution condemning the idea, also decided to launch trade union action. The minister wanted to regulate the levying of fees by the proctors and advocates, (as the lawyers were categorised then; like barristers and solicitors in England and in most other Commonwealth nations), before Administration of Justice Law was enacted in 1973 when all became Attorneys-at-Law. The minister referred to numerous complaints being received ‘regarding irregularities committed by proctors’ in connection with cases entrusted to them, the term irregularities can mean failure on the part of a proctor to diligently attend to a case in all its stages or failure to apply the funds entrusted to him in the manner it should have been or recovering fees in excess of what are legally chargeable or misappropriating monies that should have been paid to his clients. The proposed legislation is intended, it is stated, to ensure public confidence in the members of the profession. The obvious reason for the proposal is that the profession as a whole could not be trusted. The excerpts from statements made by lawyers at the meeting of lawyers’ associations to discuss the principle of ministerial, executive or legislative control of the internal organisation of the legal profession was taken up. Every bar in the outstations was represented. Proctors are not unmindful of the standards required of their profession: These are however not to be achieved by imposing impracticable and impossible legislation. There can be no objection to any requirement that a proctor shall issue receipts for all sums he received. A proctor should be required to obtain a receipt from advocates to whom he pays any fees and advocates should be prohibited from receiving fees except through proctors. The legislation is totalitarian in outlook and is a departure from democratic principles and the tradition associated with the legal profession. It proceeds on the assumption that the public and the state requirements to be protected against the profession. It is an unreserved reflection on the whole profession and affects the honour and the prestige which the profession had deservedly enjoyed over a century. Senior Counsel S. Nadesan, raising a point of order, said that he had no objection to an informal discussion of problem common to proctors and advocates. But it was undesirable that resolutions of any kind be put to the house and voted on such resolutions should be considered separately by the Law Society in the case of proctors and by the general council of advocates, in the case of Advocates. Thiagalingam QC objected to the point of order. E G Wickremanayke in Chair then ruled against the point of order. He informed the members that the Justice Minister told a deputation of the Bar Council that morning that he would not proceed with the legislation if lawyers themselves took steps to check any abuses within the profession. C. G. Weeramanthri QC said that if ministers controlled the legal profession, it will not function efficiently, and public confidence cannot be maintained or generated by rules and regulations. The lawyer-client relationship was one of trust and the imposition of controllers of fees would take away the public confidence built up by the devoted service of generations of lawyers. Regarding the minister’s statement that proctors evaded the payment of tax he said, “I have it on authority that there was no more honourable body of taxpayers in this country than lawyers. The minister’s proposal, he argued, was unnecessary as there existed organisations to take disciplinary action against defaulting members of the profession. The minster’s remedy must not control the profession by regulations, but increase the powers of the governing bodies of the profession. He observed: Some of our rules of professional duties and customs and institutions, borrowed as they are from the UK may be a little out of date. If so, it should be left to the good sense of the profession to eliminate any hardship that may be caused to litigants. We oppose the appointment of a controller of fees, as a further interference for four reasons: Extra inconvenience to clients; possible abuses in controller’s office; opposition to the principle of administrative regulation, and waste. We also oppose the minister’s plan of having a schedule of fees. This will give the minister power to fix a high or low scale. Weeramantri concluded: It is our duty as professional men to be watchful and warn the public of the dangerous trends in legislation and guard against the extension of bureaucratic control. The reported move to prevent ministerial orders from being subject to review by courts takes away the undoubted and unalienable right of every citizen in a democracy to appeal to the courts. It is our duty as professionals to condemn such legislation. Speaking on the resolution, Issadeen Mohomed said that if lawyers did not speak on behalf of public they were a disgraceful lot. “We must speak without fear.” He said the government must not set up a CID unit to go behind lawyers. V. Kumarasamy said: “Everything has gone, and only the Independence of Judiciary remains. They are trying to invade this field. They want to control our fees and then they will also try to control our arguments, he remarked. The resolution was passed by a thumping majority. There is the usual affinity between politics and the legal profession. This is so in almost all democratic nations. Lawyers always play an active role in politics. Their comprehensive knowledge of the law, the judicial system and the constitution facilitate them to be dynamic in politics. They take up issues of public interest, political and fundamental rights, which in turn, pushes them into the political arena. Most of them reach various legislative bodies, Cabinet and other administrative and political positions. Whilst numerous complaints of alleged malpractices of proctors may have been received by the Justice Ministry, the criterion should not be the number of such reports but the number of cases of irregularities has been established. It is known that 80% or more of the complaints which are received on the face of them do not merit further consideration and are misconceived. Legal practitioners should perform themselves with integrity, and promote public confidence in the judiciary. Lawyers are obligatory and expected to deal with clients with courtesy and honesty. They must not engage in conduct which is deceitful or disreputable, which would diminish the public confidence in the profession, especially in charging fees.